Cast: Donald Pleasence, Danielle Harris, Wendy Kaplan, Ellie Cornell, Tamyra Glynn, Jeffrey Landman, Matthew Walker, Jonathan Chapin, Beau Starr, Frank Como, David Ursin, Betty Carvalho, Donald L. Shanks. I prayed that he would burn in hell. But in my heart, I knew that hell would not have him. 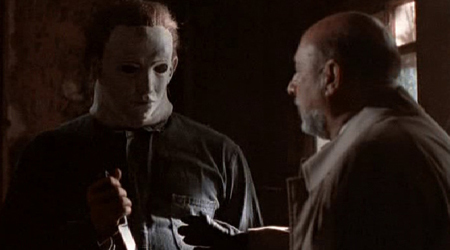 "Halloween 5: The Revenge of Michael Myers" has its fair share of detractors. Rushed into production after "Halloween 4" banked big box-office, writer-director Dominique Othenin-Girard made a number of artistic choices that disappointed fans. Little Jamie (talented Danielle Harris), suggested to be the new killer of the series, is now just a mute child staying at the Haddonfield Children's Clinic. The Myers house has inexcusably been transformed into a gothic mansion. "Halloween 4" co-protagonist Rachel (Ellie Cornell) is killed off in the first twenty minutes. Still, "Halloween 5: The Revenge of Michael Myers" has a sharp, creative visual sense and a bunch of outstanding set-pieces. From Michael's stalking of Rachel before her demise, to a chase in a cornfield, to a sequence where the bubbly Tina (Wendy Kaplan) is picked up by her masked boyfriend, not realizing it's really Michael Myers, to a scary scene set in a laundry chute, to a surprising moment where Jamie convinces Michael to unmask himself and reveals a single tear, to Dr. Sam Loomis' (Donald Pleasence) climactic confrontation with the Shape, the film moves briskly and dares to go to some very dark places. Viewers seem to despise the character of Tina, but she has always been a favorite of mine from the series, brought to energetic, ultimately touching life by Wendy Kaplan. Where "Halloween 5: The Revenge of Michael Myers" goes wrong is in a sloppy opening that makes no sense within the timeframe (has Michael been cared for by a hermit for a full year? ), and in the use of two comic-relief cops that stick out in a bad way. This is an uneven "Halloween" addition, but also more ambitious than the norm.